The Criocuum treatment involves 4 phases. After a consultation with the patient to discuss their treatment objectives, the therapist will select the appropriate vacuum applicator handpiece, which ranges to suit small fat folds, large fat folds, and curved areas of the body. Between 8-12 weeks after the treatment, the Criocuum treatment takes full effect — resulting in removal of the treated fatty tissue to deliver a slimmer, more contoured body shape and improved skin laxity. For best results, three treatments are recommended for each treatment zone, with sessions spaced at 6-8 weeks apart. The Criocuum applicator is placed over the treatment zone to initiate the crioliporeduction process, which suctions the fatty tissue up into the cavity of the hand piece while applying intense cold temperatures ranging between 5°C to as low as -10°C. Crioliporeduction treatments with Criocuum cater to the busy lifestyles of men and women who are seeking quick and effective solutions for improving their physique without the expense, pain and downtime of surgery. 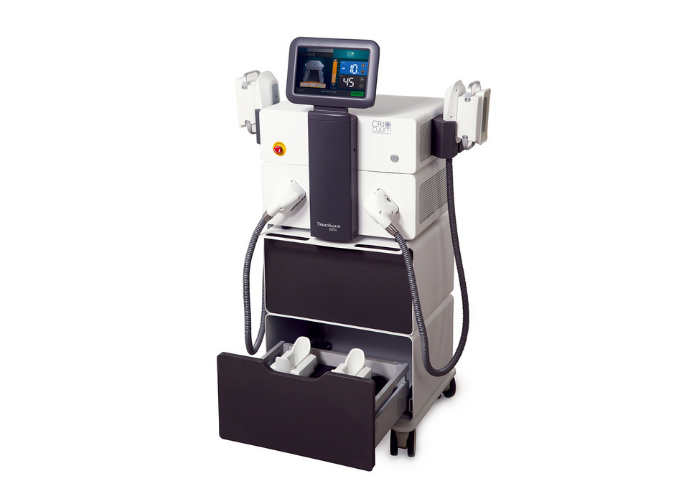 Case studies show an average reduction of fatty tissue between 3mm and 15mm, or up to 45% of the fatty tissue present for a visibly trimmer, contoured appearance.